Out of the five temples, the first temple is Vimal Vasahi Temple that is dedicated to Lord Adinath, the first Jain Tirthankar Lord. 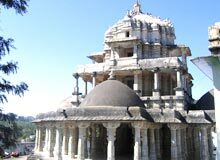 In 1021, Vimal Vasahi Temple was built by Vimal Shah, the Solanki Maharaja of Gujarat. Encircled by a passageway, the temple is erected in an open square. This temple is adorned with carved passages, columns, arches and doorways. The ceilings of this temple are festooned with patterns of petals, flowers, lotus-buds and murals depicting scenes from the mythology. There is a huge hall, which is known as Rang Mandap. This hall looks marvelous with its 12 ornamented pillars and beautifully carved out arches in the midst of a spectacular central dome. The temple also comprises an assortment of nine rectangular ceilings that is commonly recognized as Navchowki. Gudh Mandap is the main hall, where the idol of Lord Adinath is placed. Another feature is 'Hathishala' (Elephant Cell) that portrays a lane of sculpted elephants. This is the second most important temple amongst the temples of Dilwara. Built in 1230, Luna Vasahi Temple is dedicated to Lord Neminath, the 22nd Jain Tirthankara Lord. The main hall of the temple is known as Rang Mandap. This hall comprises a central dome with a carved pendant. Here, not less than 72 figures of Tirthankars are positioned in a circular band. Made on the same structural pattern, Luna Vasahi Temple also has a Hathishala with 10 marble elephants. Again, Navchowki holds nine delicately carved ceilings with intricate marble work. The main hall or Gudh Mandap has the idol of Lord Neminath that is carved out of black marble. On the left side of the temple, there is a big pillar made out of black stone by the name of 'Kirti Stambha'. Pittalhar Temple is dedicated to Lord Rishabdeo, the first Jain Tirthankara Lord. Built by Bhima Seth, the temple comprises a huge image of Lord Rishabhdeo. This image is made of five metals and brass (pital) forms the major part of composition. Due to this fact, this came to be known as 'Pittalhar'. Once again, the temple contains a Garbhagraha, Gudh Mandap (main hall) and a Navchowki.